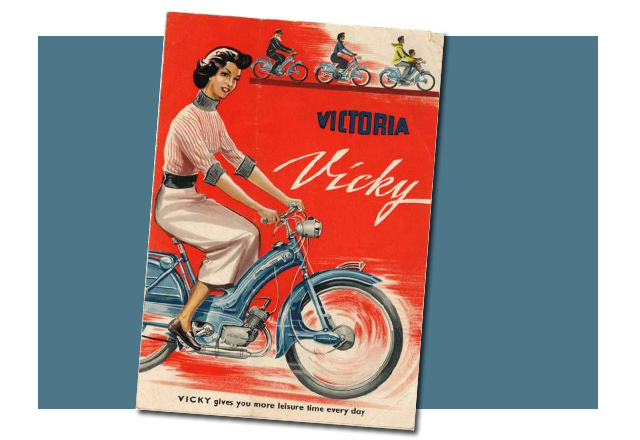 Vicky needs Knight on Shining Moped! I spotted a Vicky 117 in a House Clearance Unit in poor condition minus engine but may contain some useful bits to a marque collector. The unit is in Caerphilly. I have 2 phone numbers as the guys are not there at all times: 07487 741640 or 07863 205640, or e-mail robs2riches@outlook.com. There is a Facebook page too – https://en-gb.facebook.com/Robs2Riches-reclaimed-household-goods-1386679171617771/. Also, there was a Lambretta which looked in very good shape but so hemmed in by furniture could not get too close and it not being ‘my bag’ as they say, didn’t push it. I will try to get a stay of execution as I think these guys only see it as scrap to be weighed in but some of our guys will see it as treasure. if you are the rescuer! August’s Buzzing is on its way! The August edition of Buzzing is at the printers and should be with you in the next week or so. Usual array of reports from the East Coast Pedalers to the Shropshire Buzz’ards. There are also tales from July’s National Rally, the 25th Rando Cyclo at Sars Poteries and the first of the Wirral Wobblers’ installments from their Northern Ireland Challenge – complete with snow in May! Vintage 1920s’ Cykelaids and a very special ‘special’ also make it into the features. Oh, not forgetting the ads! 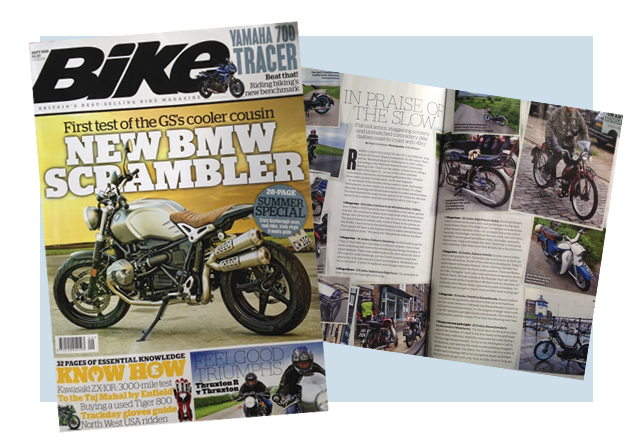 The September issue of Bike magazine (on sale now) contains a great two page article on this year’s NACC Coast to Coast Run written by Bike magazine journalist Nigel Grimshaw who entered and completed the event on his Puch Maxi moped on his first attempt. An informative article with some first class photos. Our regular monthly meeting on the last Thursday of the month at The Corbet Arms, Uffington near Shrewsbury will be suspended until September. So NO meeting this Thursday (28th), nor on 25th August. But, it will be business as usual on 29th September. 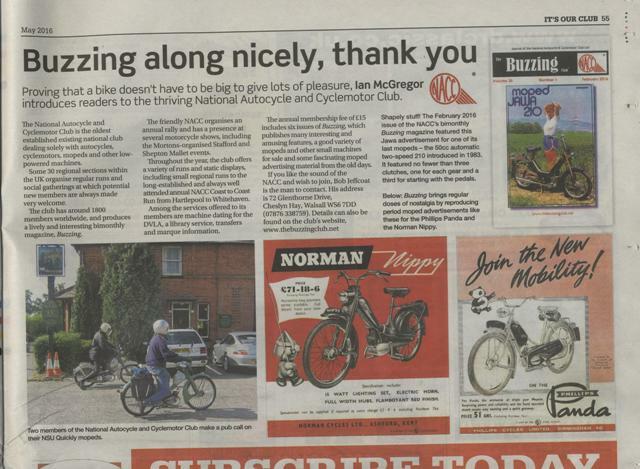 Remember we will be at the Cleobury Mortimer Classic Bike Show on 10th-11th September – see our earlier posting. Look forward to seeing members there. 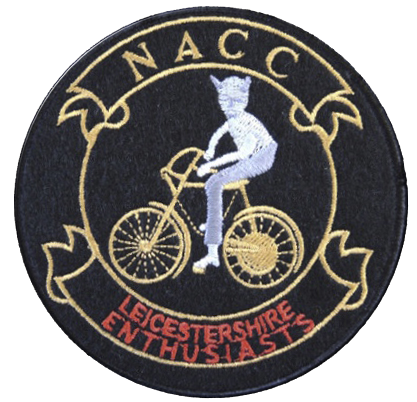 The Leicestershire Enthusiasts Section flew the NACC flag at this year’s Vintage Motor Cycle Club’s Founders Day at Stanford Hall on 17th July. The day that someone at last turned the summer on! It was gloriously hot and sunny. Featured marque was that good old thumper, the P&M Panther, and the central arena was filled with the rumbling sound of many a big single … although the Leicestershire contingent added some variation to the mechanical symphony by taking a few of their machines around the arena – suitably attired of course! And, is that a crate of Guinness on the back rack?! Hopefully ‘beer goggles’ (stout goggles?) won’t affect the report to appear in Buzzing. Don’t want tales of Bown Autocycles burning off the Vincents and Broughs! ‘Don’t miss out!’ says Ted Bemand. August’s edition of Old Bike Mart will feature more of the Wirral Wobblers’ serialised exploits from their Northern Ireland Challenge earlier this year. Parts 1 and 2 have already appeared in June and July’s issues. It’s conclusion time in August! If you don’t subscribe to OBM, fear not. 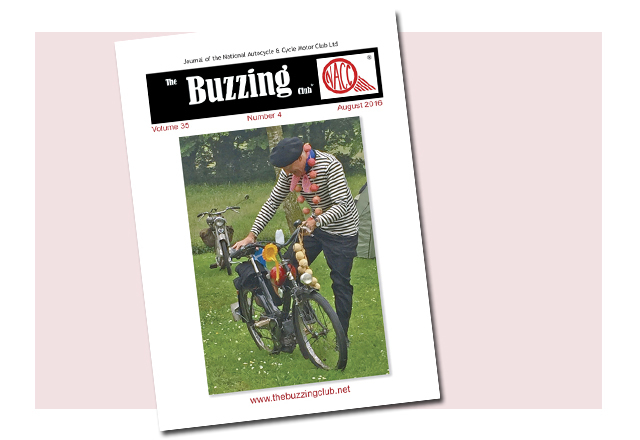 Ted’s articles will also appear in Buzzing, starting with August’s edition – and, of course, John Maconaghie of the Northern Ireland Section got the ball rolling with the host’s perspective which appeared in June’s Buzzing. While we’re at it, a BIG THANKS to OBM for our club feature back in the May edition (see above) . It generated quite a bit of interest … with a few new converts to the slow lane world of under-powered, low capacity, two (and three!) wheeled wonders! The Borders Classic Bike Show is something that the section has supported for many years, but details such as this year’s dates have only just emerged. 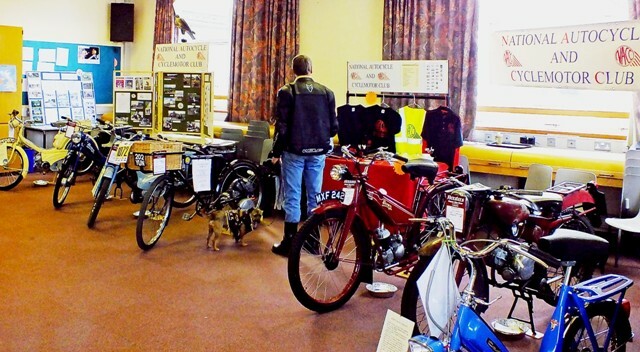 Organized by Jim Reynolds, this year’s Borders Classic Bike Show is on 10th-11th September at Lacon Childe School, Cleobury Mortimer, Shropshire. 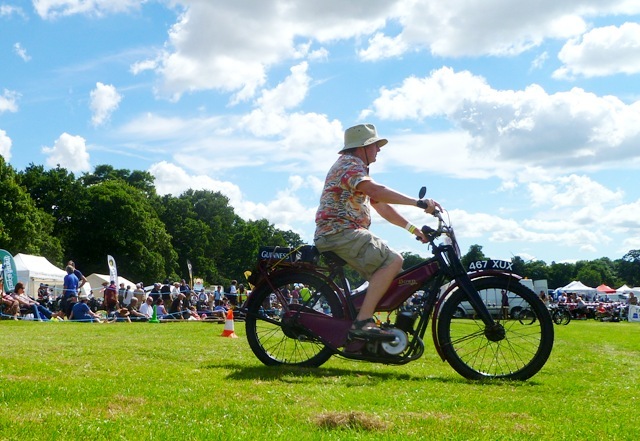 The Shropshire Buzz’Ards have displayed and won prizes at this show for many years – ‘Best Club Stand’, 2011, ‘Most Original Machine’ and ‘Best Welsh Moped Rescued from a Number Plate Dealer’s Skip’ awards, 2015. I kid you not! Previous shows have been very informal, much cake, auto jumble, exhibitor camping in the school grounds, and a curry night. At the time of writing there appears to be very little publicity for this event, which is in its 28th year – anyone interested should contact John Burgess (Shropshire section contact) on 01270 500469 or john@jburgess77.orangehome.co.uk or alternatively Bob Terry (South Staffordshire) or Liz Butler (Events Secretary) – 01902 842198 or rterry526@btinternet.com. The postcode given in June’s Buzzing is wrong! The correct postcode for Kingsdown campsite is CT14 8DU. Sorreee! !